The old adobe was built in 1847 by David Wight as a home for his wife and daughter. The home was based on Wight's ancestral home in Ayton, Scotland. Later, in 1855, the Old Monterey Whaling Company began shore whaling operations and used the adobe as a headquarters and employee residence. Today, one can still find the great iron pots which rendered the blubber into oil. 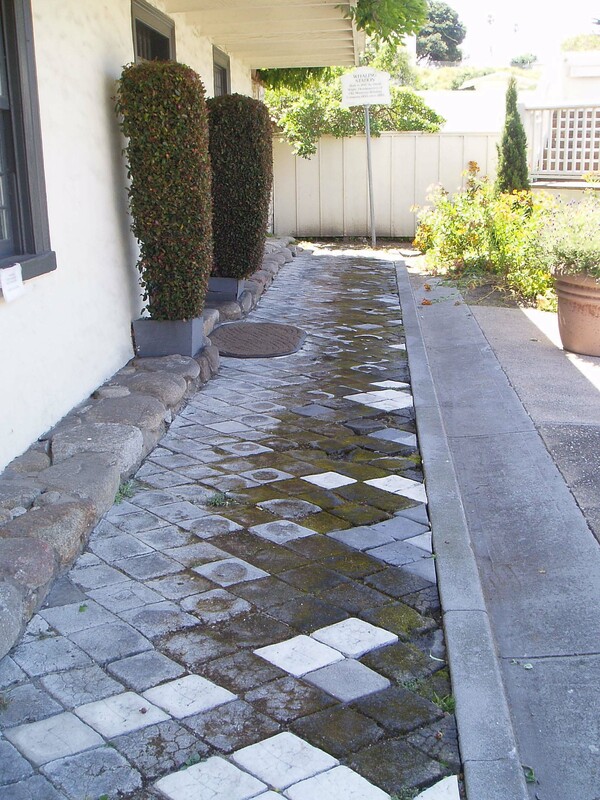 The front walkway is made entirely of whale vertebrae. The bone was cut into diamond patterns which give the sidewalk a unique look. The sidewalk cannot be replaced, so please be careful where you walk! Wander around in back and enjoy the beautiful roses and other plantings that make this area especially beautiful. Perhaps, while visiting this historic setting, you may experience the touch of cool ocean fog on your skin, hear the call of seagulls, or the infrequent moan of a distant fog horn. And, if you listen very quietly, you might even hear the fainter cry of "Thar she blows!" At one time, Monterey had a busy whaling industry. The huge ocean mammals were killed at sea and brought to shore. At several "rendering" plants, the animals were cut up for commercial uses. The fat or blubber was heated in large pots to extract natural oil. The oil was used for machinery and in lamps. Baleen, or the large bony filters found in the mouths of filter feeding whales (locally, Grey and Humpback Whales), were harvested for corsets and umbrella stays. The bones were either ground up for fertilizer, used for structure foundations, or used in early-day sidewalks! At times, so many animals were killed that the author, Robert Lewis Stevenson, mentioned seeing the bleached bones of whales on the beaches of Monterey. Today, it is illegal to kill whales in the United States and in most countries of the world. This moratorium has been declared to prevent extinction of the world's largest mammals. Whale bone vertebras were used as an inexpensive surface material in sidewalks in place of cement and wooden planks. Due to the passage of time and the deterioration of early-day whale bone sidewalks, only a few sections of these unique walkways still exist in the United States. The beautiful home and flowering gardens are used as a backdrop for weddings, receptions, parties, business functions and other special events. Funds received go toward educational and charitable purposes for improving the community through the leadership of trained volunteers. Available for special events and weddings. Call, write, or e-mail admin@JLmontereycounty.org for more information. Junior League of Monterey County.